Russia has abandoned plans to build a large fleet of Antonov An-140T tactical airlifters as replacements for aging An-26s and An-72s, thanks to deteriorating relations with the new regime in Ukraine, where Antonov is based. Instead, the Russian defense ministry has revived the Ilyushin Il-112 project, a development of the Il-114 airliner, even though it was shelved in 2010 in favor of the less expensive An-140T. The An-140T is a ramp-loading version of the 52-seat An-140 turboprop airliner that the Aviacor plant in Samara makes under license for airlines and government customers. The Russian defense ministry has already acquired several An-140s out of a total order for 20 such aircraft. Russia supported Aviacor’s plans to develop An-140T jointly with Antonov. But negotiations stalled in late 2013, when the pro-Western regime took power in Kiev. Russian deputy prime minister for military-industrial complex Dmitry Rogozin has confirmed that the Il-112 and Il-114 are back. The Il-112 will go into production at the VASO plant in Voronezh that is likely to discontinue manufacture under license of the Antonov An-148 twinjet airliner. VASO general director Sergei Yurasov confirmed that the talks on making a pair of Il-112 prototypes—one for ground testing, the other for flightsare ongoing. According to local media, the MoD has agreed to provide an extra Rouble 8 billion ($222 million), thought be enough for completion of design documentation and production preparations. The Il-112 and the new version of the Il-114 would share onboard systems and powerplants, making both projects more economically viable. Rogozin is known to favor the Il-114 over the alternative of license-production of the Bombardier Q400 NextGen twin turboprop. He recently noted that the Ilyushin design bureau is ready to modernize the Il-114. 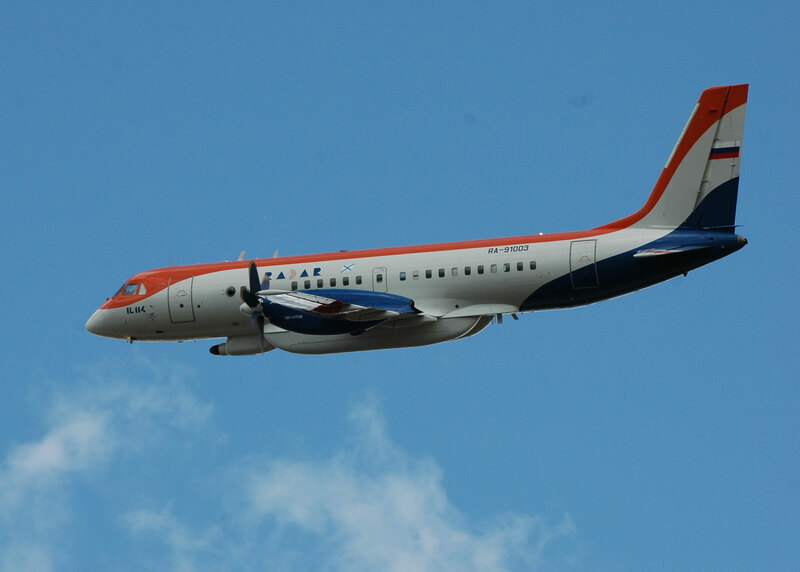 The “new” Il-114 would replace An-140 production at Aviacor. Both the “new” Il-114 and Il-112 would be powered by two Klimov TV7-117SM turboprops. Even though these have demonstrated lower fuel burn than Pratt & Whitney Canada’s PW127H (on the westernized Il-114-100 certified in 1999), they had lower reliability and lifetime–currently between 2,000 and 3,000hours, which is three or four times less than the Canadian alternative. A handful of Klimov-powered Il-114s served with Uzbekistan Airways (1998-1999) and Vyborg (1999-2010). Revenue flights were terminated due to limited lifetimes and immaturity of engines and systems. The only TV7-117SM-powered airplane still operating belongs to the Radar-MMS company, which uses it as a flying laboratory for testing various radar antennas and associated systems. Ilyushin is offering the Il-114MP to the Russian navy. It can loiter for 8 to 10 hours carrying 1.5 tons of sonobuoys and depth charges. This version is outfitted with a modern search-and-attack radar, a magnetic anomaly detector and a thermal imager. The Il-114MP is intended to supplement and then replace the aging Il-38. The Russian navy has plans to rework approximately 30 Il-38s into Il-38N version with the Novella-P-38 ASW set. Ilyushin holds an initial contract for five aircraft, first of which was delivered to the customer on July 15, 2014.